 High strength aluminum alloy construction, lightweight & durable.  Sponge removable design, more convenient to install and clean.  Adjustable angle of the handlebar allows to find the suitable comfort.  Used to relax under a good road conditions in the long-distance cycling.  Clamps fit the bar tubes of diameter between 2.2cm-2.65cm, max support 3.3cm. 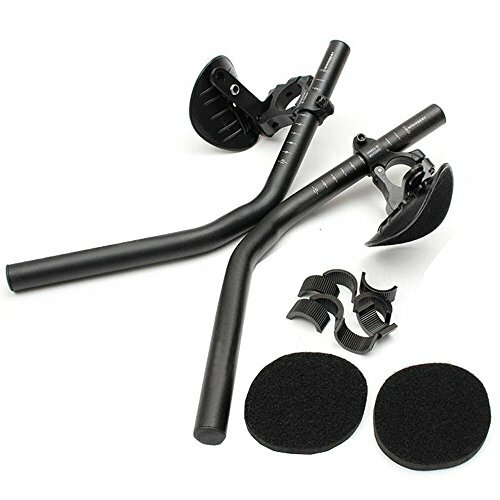  Easy to install and adjust the angle freely, use the gasket when install on the small handlebar.  Can be used for road bikes, long-distance mountain travel bikes, etc. Good companion for riding enthusiasts.  Superior Quality: High strength aluminum alloy construction, lightweight & durable. Thick arm rest paddings provide arms' safe comfortable protection.  Easily Install & Clean: Use the gasket to install on the small handlebar, easy to operate and freely adjust the angle. Sponge removable design, convenient to clean.  Good Companion: Suitable for relaxing under a good road conditions in the long-distance cycling. Can be used for road bikes, long-distance mountain travel bikes, etc.